In the world of style, a lot of things come and go. Yet, when it comes to flowers, it's a totally different story. Floral prints and shapes are the epitome of fashion staples. They're timeless and classic, paying no mind to what era you live in. It's even better when the flowers are simple and versatile. Take this DIY floral bib necklace, for example. You can pair it with anything from your favorite LBD to a trendy festival outfit. Better yet, it can be thrown on top of a basic white t-shirt. Done and done. This DIY jewelry project will make the sweetest statement. Here's how to make one yourself! * As the flower centers, there are a lot of options for these components. You can use basic buttons or charms. Alternatives include plastic, metal, and rhinestone embellishments from the scrapbook section at the craft store. The jewelry aisle may also have simple metal pieces like the ones used in this project. Using the cutting portion of the pliers, cut a strand of wire measuring at least 8 inches. Place your ring, middle, and pointer fingers next to each other. Wrap the wire around these three fingers twice. Remove the wire loop from your fingers and pinch the bottom (left). Next, twist the bottom of the loop until it forms a teardrop shape (right). The more you twist, the smaller it will be. I recommend twisting it a few times to just secure it first. Later on, you can adjust it accordingly. To create a total of five petals, repeat Step 2 four times. Adjust the petals so that they're around the same size. Again, you can do this by twisting the bottom. Carefully snip away the excess wire with the pliers. Glue all five petals to the back of one charm or embellishment. For extra security, add a drop of super glue to the center. Leave to dry completely. Repeat Steps 1 through 4 until you have three flowers. Feel free to make more, if you'd like. Make sure the glue is totally dry before handling them any further. 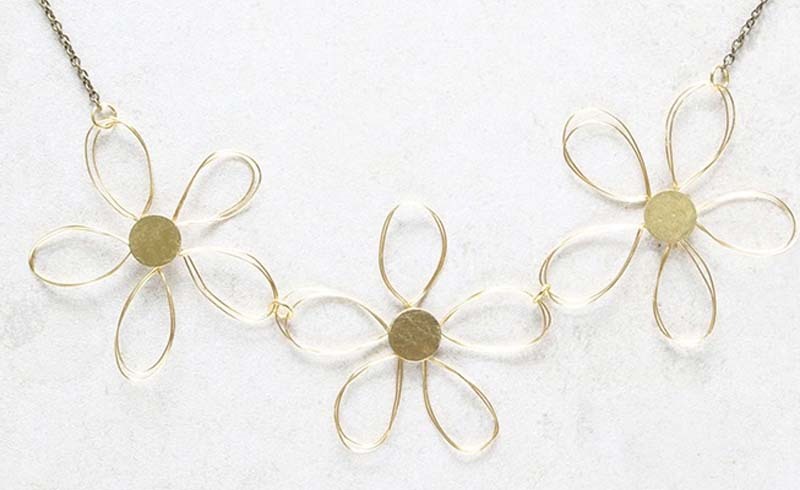 To complete your DIY necklace, connect the flowers with jump rings. Attach a strand of chain to each side depending on the desired finished length. On one end, add a jump ring and a jewelry clasp. Add a jump ring to the other. And you're done! This simple, beautiful necklace is the perfect summer accessory handmade gift for anytime.